Like you, we've read our fair share of bland year-end roundups and predictions. Don't worry, this isn't one of them. We promise to pack it with plenty of spice — just like all the personalities at your family's holiday dinner. Every year promises its share of new additions, cool kids, shake-ups and even comebacks, which all play out at the table (or in headlines). We took a look at our dataset made up of thousands of customers, 4,000 applications and millions of daily logins to highlight the best of 2015 — and predict which technologies you'll be hearing from in 2016. 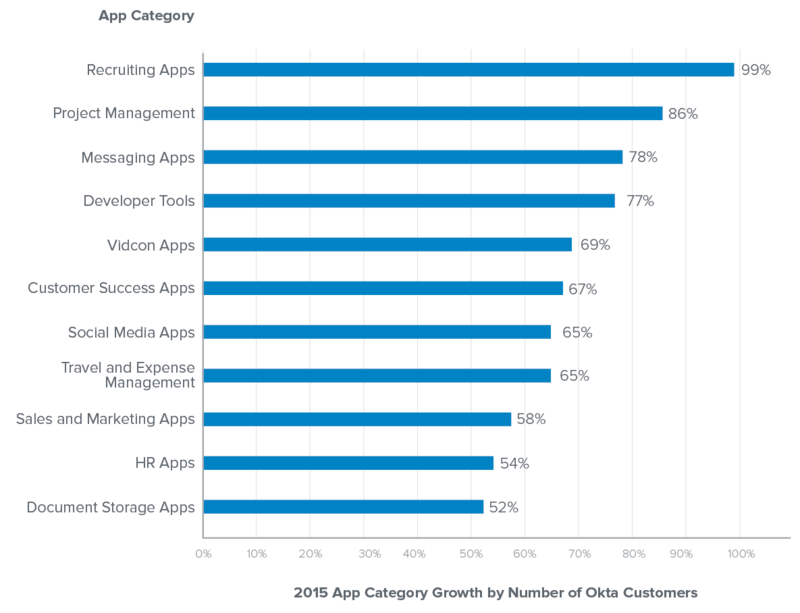 Organizations looking for the hot work apps should look no further than Okta's fastest growing apps of 2015. Slack, Greenhouse, Envoy, Zapier, Windows Azure Public Cloud Services, Bamboo HR, Wrike and Lucidchart were on fire this year, all seeing usage across Okta's customer base grow at over 200%. If you haven't already, get to know these guys — our data suggests they'll be the next big apps of 2016. 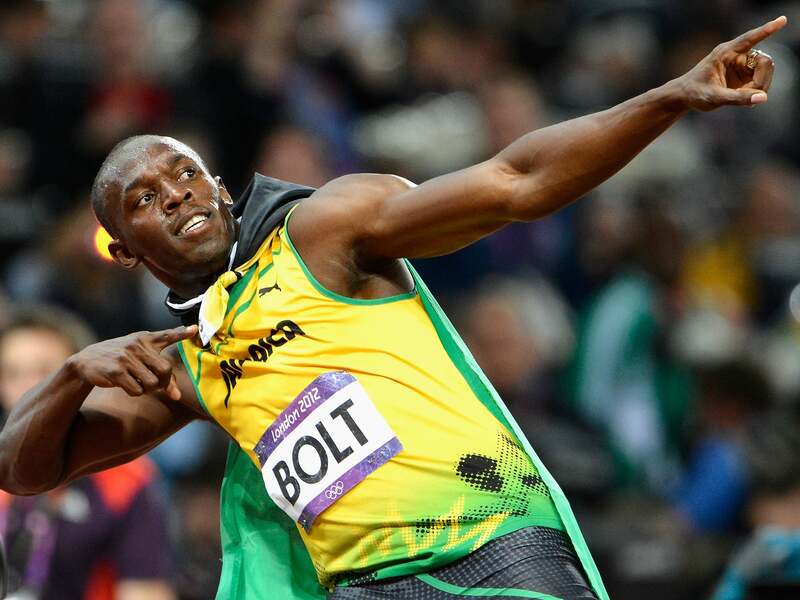 And Slack might as well be the Usain Bolt of enterprise apps. There's no slowing it down. Slack's popularity has only continued to increase since we released our Businesses @ Work Report in August, and it's still the fastest growing app in our network. 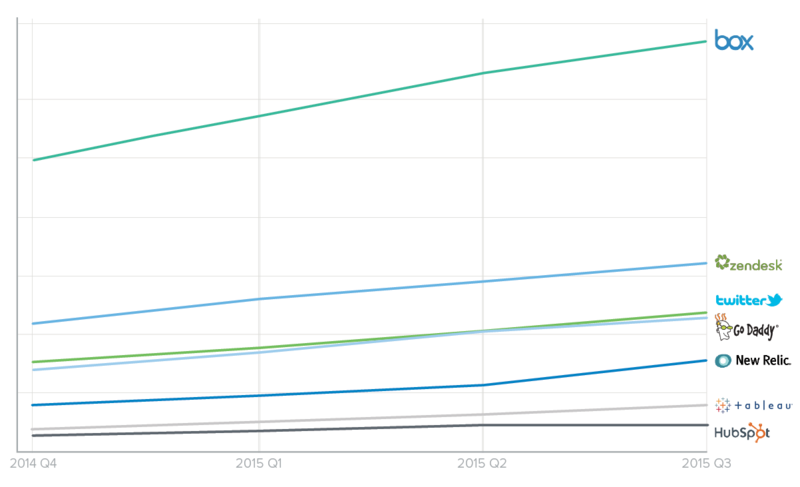 In 2015, Slack grew 667%. 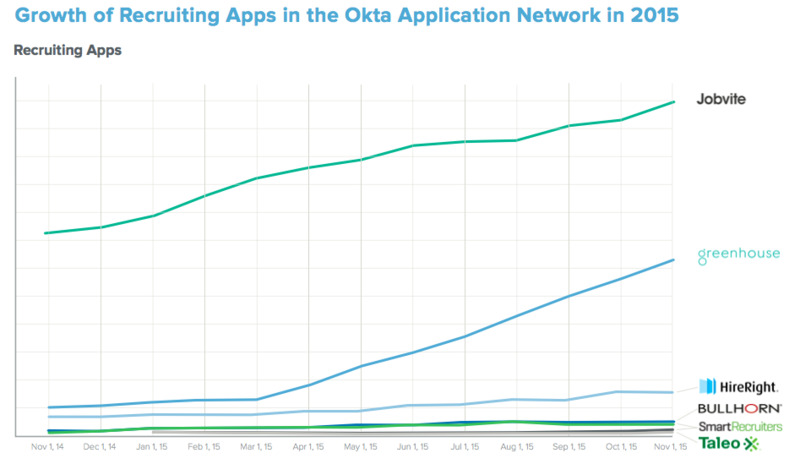 We combed the Okta Application Network to reveal 2015 customer growth of recently public companies, and found that of the newly public companies in our network, the number of organizations using their app or service within the Okta Application Network has increased by over 60%. In the wake of IPOs, cloud companies clearly continue to build strong customer bases. We're looking forward to keeping an eye on the newly public Atlassian, which from 2014-2015 experienced customer growth rates of over 70% for its three key apps: 72% for HipChat, 96% for JIRA and 116% for Confluence. Not only are we seeing job growth in the US economy; we're also seeing cloud growth in the recruiting industry. The number of customers in our network using recruiting apps has grown by 99% this year, beating out the growth of customers using project management and messaging apps. 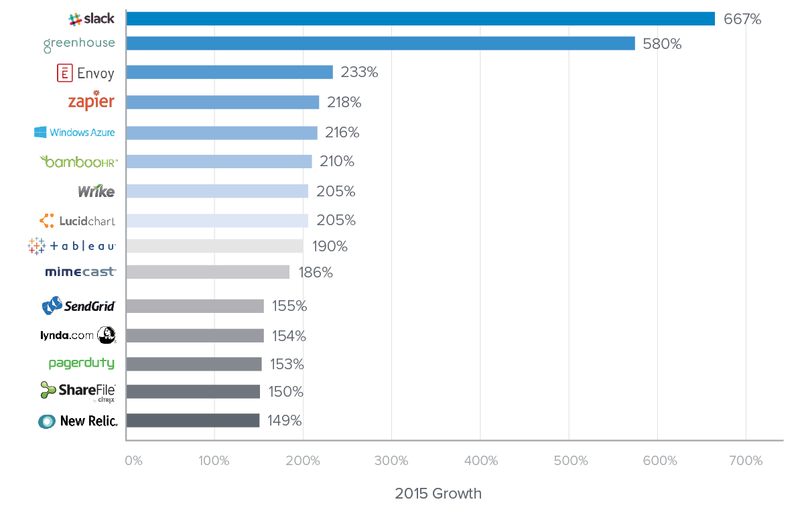 Jobvite continues to be the top recruiting app in the Okta Application Network, but Greenhouse is making serious moves with over 580% growth from November 2014 to November 2015. Recruiting cloud apps and services are clearly winning the hearts, minds and pockets of teams, and we expect this trend to continue into 2016. The classic security question is declining, praise be, considering it takes just five minutes to find out someone's mother's maiden name, hometown or first pet via social media. With consumers already comfortable using multi-factor authentication with services like Gmail, Twitter and Facebook, we're seeing companies move away from using the security question as a form of verification in favor of newer options. In turn, providers are getting innovative, using things that you possess — your phone, watch — and things that make you, you — your fingerprint, iris or voice — to authenticate into cloud apps and services. Our data also shows an increase in soft token (Okta Verify, Okta Verify with Push, Duo, Google Authenticator), hard token (RSA SecurID, Symantec VIP, YubiKey) and SMS authentication options, surpassing the security question in the percentage of employees using those factors. With tokens on the rise and security questions on the decline, MFA is finally saying "hello, it's me" to the enterprise. Since Okta's inception, CIOs and IT professionals have largely owned internal identity management — what you might think of as web single-sign-on for employees — within organizations. But as mobile apps, cloud services, and the Internet of Things reshape how industries get business done, and force every organization to become a digital one, the use cases for identity have expanded. Businesses are building identity layers into their customer and partner-facing websites and portals, as evidenced by the 439% growth of the external identities in Okta's network in 2015, as compared to 129% growth for internal identities. And as the risk of breaches increases, security decision makers will become key players in digital business initiatives as well. We're seeing an almost 30% growth year-over-year in the number of Okta deals where a CSO or CISO was involved in purchase decisions for identity management. In 2016, IT and security leaders' roles will continue to expand as they take on digital business initiatives and own more critical business services. Enterprise tablet use is at a standstill; tablet makers need to rely on partnerships and new functionality to stay relevant. There's been talk of the brief life of the enterprise tablet coming to an end. 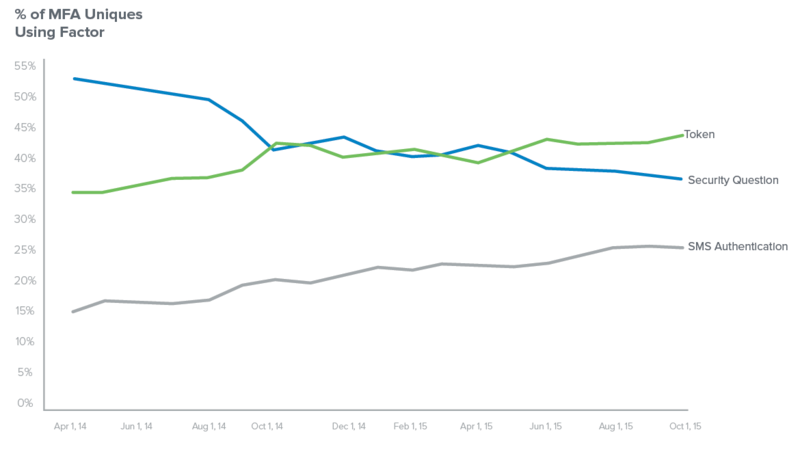 Not only are global tablet shipments declining, but we've seen a relative standstill in tablet usage year-over-year in our network, with tablet usage just slightly declining by 1% in the Okta Application Network from 2014 to 2015. The mobile workforce requires tablets to add more value than simply enabling email and web browsing to fully leave desktops and laptops behind. 2016 will be a make-or-break year for enterprise tablets. In order for them to survive, manufacturers need to seek out and invest in strategic partnerships to add more computing power, better apps and features designed for productivity. If they can do it, we predict a Justin Bieber-esque comeback. Because let's be honest: Diplo and Skrillex's support is the reason Justin's back in the game. It's now possible to start and run a small-to-midsized business with no infrastructure: zero physical locations, zero warehouses, zero servers, zero software. That's right — the zero infrastructure business is becoming a reality. PWC says that "public cloud services are dramatically outpacing general IT spend at 22% versus 4% CAGR." And Gartner predicts that of the $149.9 billion spent on enterprise application software in 2015, "the majority" went towards modernizing, replacing or extending existing business software using SaaS. Okta's own dataset shows that the median number of off-the-shelf cloud apps at companies has grown 33% year-over-year, Amazon Web Services has grown at 123% year-over-year, and Microsoft Azure Cloud Services at 216% year-over-year. To learn more, download our full "Okta's Best Of: 2015's Cool Kids, Shakeups and Comebacks" report here, and share your thoughts with us @Okta with the hashtag #OktasBestOf.